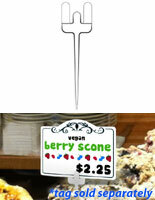 How can your business benefit from using deli spear tags to promote a variety of food items, cheaply? These delicatessen badges are made of write-on plastic for advertising prices and types of fresh fish, meats, cheeses, and pre-made salads in a glass showcase. These deli spear tags for a grocery store are available in an assortment of designs to suit all types of edible merchandise. The injection-molded food badges are sturdy enough not to flop over in a bed of ice when showcasing the per-pound price of shellfish under a display counter. 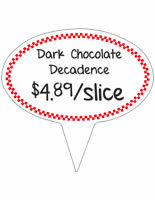 These deli spear tags, also known as plastic price signs, are a no-hassle way to present a variety of baked goods from muffins to chocolate chip cookies. 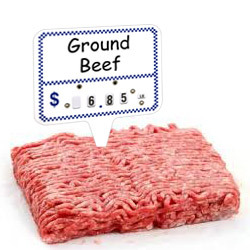 Each of these quality sign holders for advertising the price of meat can be purchased in sets of 24 or 50 at bulk rates to save money! These deli spear tags, display picks, have a white shiny surface that can be written on with dry-erase markers and reused. These food signs for a delicatessen provide information about items in a grocery store cabinet, saving staff from having to answer questions, so they can focus on serving. What types of inventory are these commercial price picks best suited to advertise? The deli spear tags comes in a variety of configurations for myriad types of advertisements for edibles, and because sign picks are re-usable, companies save money! These economical plastic pins for signage are sold in sets of 24 or 50 and bulk priced! Wherever a variety of food supplies are being presented, these food labels can be identified by name, category, region, price, or all three! Showcase local shellfish specials (“catch of the day”) for crab, lobster, shrimp, clams, and mussels with durable plastic signs that won’t flop over in the ice! Place a metal sign tag into a block of blue cheese, parmesan, or brie so customers can efficiently place their order. Advertise specials on meat selections including roast beef, ham, turkey, or salami with signage with a classic red - or blue - checkered border! Fish are best displayed by a plastic spike design that pokes into crushed ice beds, while slide-in or pivoting channel tagging is perfect for baked goods. A price holder with number wheels and a write-on panel provides a customer with different types of info about one item. Our extensive line of sign ticket systems is priced to sell! Call by 2 p.m. M-F EST for same-day ship for most in-stock orders! This reputable company offers sharp-edge merchandising systems since 1974 plus an amazingly efficient, informative customer service team. Dress your deli counter with the handy labeling systems here. Place your order online 24/7, or call 1-800-572-2194 for assistance.